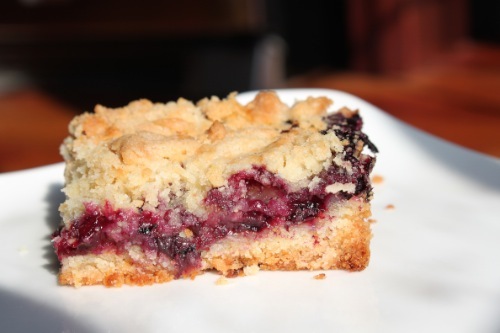 Smitten Kitchen’s blueberry crumb bars (from 2008!) are the perfect solution for the non baker who wants to bake. Actually I don’t think I can call myself a non baker anymore. I am building up a pretty decent repertoire! Every weekend we head to the shore, and every weekend we drive by the blueberry capital of the world, Hammonton, NJ. 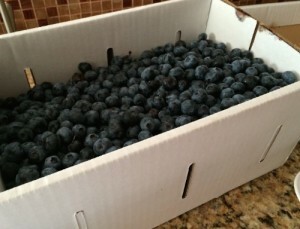 My friend picked up a 10 lb box of gorgeous farm blueberries for us last week, and I was so excited. After stuffing handfuls of berries into our cheeks and baking 2 batches of muffins, I thought for sure there would be no blueberries left. There were about 2 lbs of blueberries remaining. I didn’t have enough time to bake a pie, and I want to save that experience for a day where pie is my only focus. Instead, I baked these blueberry crumb bars I found over on Smitten Kitchen. PhillyBoy never eats desserts. I mean never as in I’ve seen him eat something sweet maybe 5 times in the 5 years we’ve been married. Clearly I’ve been serving the wrong desserts because he went wild for these bars. Here’s the original recipe from allrecipes.com. 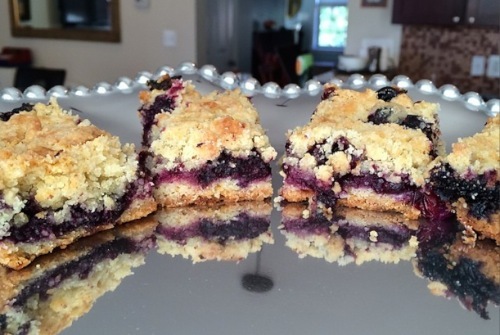 Here’s the version I used: Smitten Kitchen’s blueberry crumb bars. The only change I’d make next time is to add more blueberries, which I adjusted in the recipe below. 1. Preheat the oven to 375 degrees F. Grease a 9×13 inch pan with butter. 2. Stir together 1 cup sugar, 3 cups flour, baking powder, salt and lemon zest. Blend in the butter and egg using your hands Note: The original recipes calls for a pastry cutter or fork, but I couldn’t make either work for me. Press half of the crumbly dough into the prepared pan. 3. In another bowl, stir together the sugar, cornstarch and lemon juice. Mix in the blueberries. Sprinkle the blueberry mixture evenly over the crust in one even layer. Crumble remaining dough over the berry layer. 4. Bake in preheated oven for 45 minutes, or until top is slightly brown. Cool completely, I mean completely, before cutting into squares. Cooling them completely is the trick to getting perfect squares. 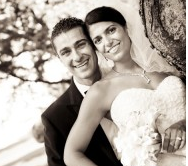 PS – Check out my latest Babycenter post.